Square Enix finds another teat. Few RPGs have developed as rabid a following as Square Enix's Final Fantasy Tactics. Fans clamoured for a sequel but were disappointed when Final Fantasy Tactics Advance for Game Boy Advance fell short of what were lofty expectations. Never one to give up on a sure thing, the publisher has announced two more games in the series. 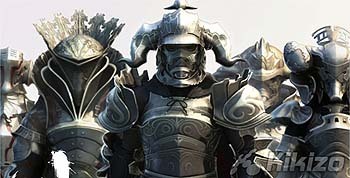 The first, Final Fantasy Tactics: The Lion War is a PSP port of the PlayStation hit, reports 1Up. The game will be enhanced to take advantage of the relative power of the PSP, including new anime-style movies to help the politically charged story along, and at least one new character class - the Onion Knight. Less is known about the second game, Final Fantasy Tactics A2: The Sealed Grimoire, but 1Up speculates that this could be a follow-up to the Game Boy Advance game for either that portable or the DS. The announcement is more proof of Square Enix's love affair with handhelds. Just last week the company said it would bring the latest proper instalment in its massively popular RPG Dragon Quest exclusively to the DS. The company is also working on a side-story for Final Fantasy VII for the PSP.